With average hiring time of over a month, high growth companies cannot fill urgent positions fast enough. Significant portion of the hiring process is spent revising CV-quality with many candidates dropping out in the middle of the application process. Head-hunters and recruiting agencies charge a hefty fee on top of the operational cost of the HR. No more waiting for a job board to generate results. All candidates are active & have been reviewed by an experienced HR manager and the MoBerries AI quality filter. MoBerries only matches candidates interested in the company who have the right skillset and experience for the position—even for non-traditional roles. Industry-leading cost per quality applicant with an over 40% company acceptance rate for candidates. MoBerries is a neural network based on interactions between HR managers and candidates, designed to streamline the hiring process. For our VC & Corporate partners, we offer the micronetwork: the ability to share candidates exclusively within your portfolio, or across department. If you have a large team recruiting across a variety of positions, ask us about activating Department Feature for your recruiting team. We pride ourselves on our referral system which focuses on active job-seekers. Sharing is caring — partners recommend their unneeded candidates from outside our network. All candidates who opt-in are active and pre-filtered with feedback. Our affiliate network of head-hunters and recruiters share candidates they did not staff, offering them real-time opportunities within the MoBerries network. We have reached network effects in Berlin, Hamburg, Munich & Frankfurt. 15% of MoBerries candidates are recommended by their friends who have found a job through MoBerries. 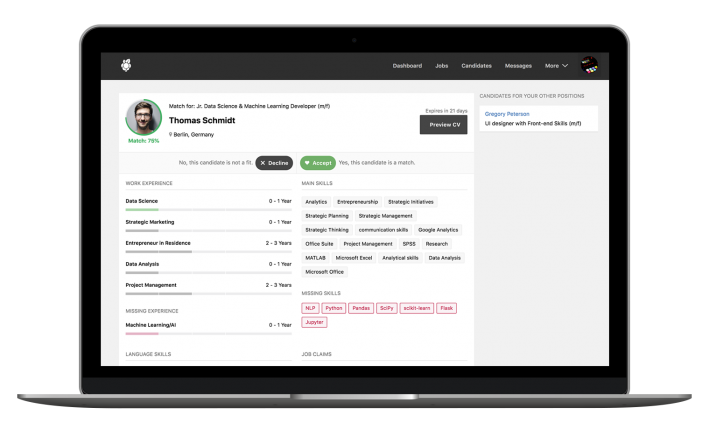 Designed for efficiency, our latest release introduces real-time candidate scoring. MoBerries AI automatically benchmarks the CV against the job description. 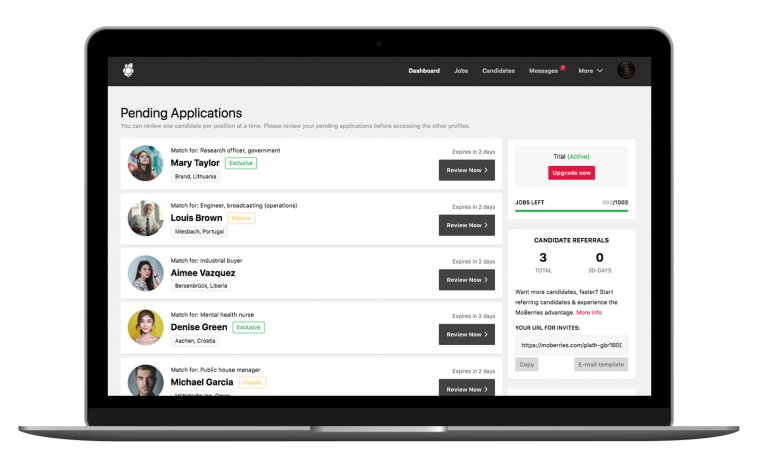 The platform shows where candidates are an ideal fit and where they lack skills or characteristics — further streamlining your decision making process. Parts in grey contain additional information provided by the candidate. Information in green highlights compatibility with the job description. 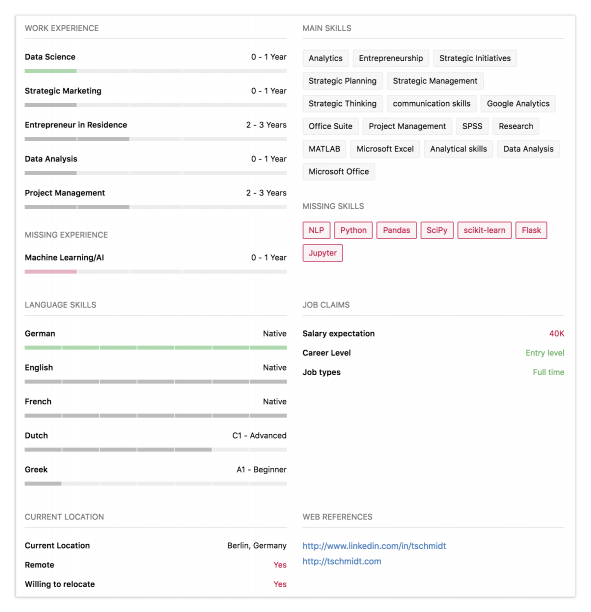 Information in red shows a mismatch between the job description and the candidate's CV. 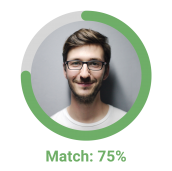 The Platform approves candidates with a minimum compatibility score of 42%, taking the guess work out of the hiring process. 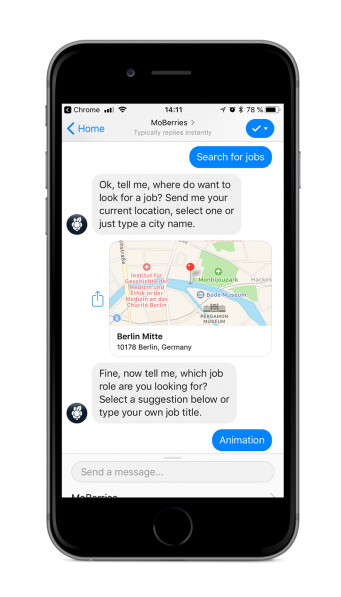 MoBot chat allows MoBerries to keep candidates active and engaged in the hiring process. 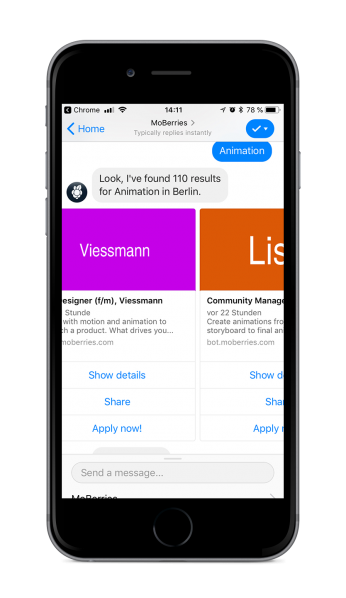 Candidates interact with the MoBot using Facebook Messenger, Telegram and WhatsApp. How do candidates use the MoBot? MoBot has a real-time approach, learning through experience. Interacting with candidates offers it the possibility to expand its knowledge in real time, ensuring better results for candidates. MoBerries is the perfect partner for Takumi to find top talents at scale. Through the innovative matching system MoBerries delivers candidates who are relevant to our specific hiring profiles. This helps us to keep up with our global hiring plans and grow efficient. MoBerries delivers a constant stream of high quality matches for employers. I am particularly impressed with the speed of responses and the access to local talent - not just in Digital but across a variety of roles. On top of all this, we feel very well looked after by the MoTeam and we look forward to new additions like our ATS integration. We are convinced: MoBerries is the ideal platform to match suitable candidates with the right skills to our various job descriptions! We offer a discount of 10% for yearly upfront payments.